I expect a lot out of face masks. They’re treatment items, usually expensive, and boasting immediate results so that’s what I expect – results. Especially since there’s nothing worse than spending money on a mask that under delivers or causes a reaction. Sensitive skinned ladies you with me?! These past few months, I’ve been on a rampage testing out over forty different masks – yes, I’m just as surprised as you are my face didn’t fall off during the process – and rounded up a list below of the ones I kept reaching for again and again. 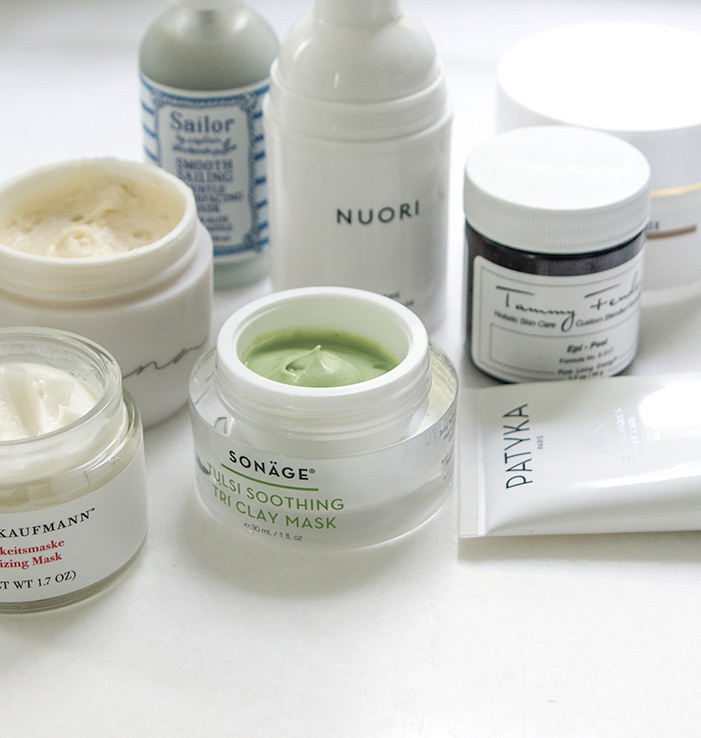 Now, just a reminder that I have dry, mature (ugh) and sensitive skin (sensitive usually to acids), so these mask picks reflect what works to combat rough texture, acne, dryness, and dullness in my skin world. I do think these would work for more resilient, oily skin types as well, BUT you lucky ladies may prefer reaching for more intense masks I can only dream of. 1. Tammy Fender Epi-Peel – This mask has a daunting sounding name if you have sensitive skin. Anything with the word “peel” makes me anxious, but as I’ve mentioned before, this THE BEST exfoliating mask for gentle texture smoothing. It uses tapioca starch (super gentle!) to physically exfoliate dead surface cells with the gentle detoxing capabilities of kaolin clay. When my skin was at its most sensitive, it still needed exfoliation, and I actually found this mask was the only thing I could use – masks with acids were too intense then. 2. Ayuna Essence – This is my other exfoliating mask fave. It’s luxury all the way with a price to match, but SO GOOD. I’ve reviewed it here but had to add it to this list again. This mask adds more moisture to the skin than the Tammy Fender Epi-Peel. It’s an exfoliating gommage that leaves behind an oil finish on the skin. If you have mature, dry skin – I would suggest this mask, whereas the Tammy Fender mask is better for those looking to simultaneously exfoliate and detox breakouts. 3. Patyka Intensive Moisturizing Mask is the one you want to reach for when your skin has that “no matter what I slather on it feels dry in ten minutes” feeling. This overnight sleeping mask was able to restore a comfortable hydrated feeling to my skin after I over stripped it with a clay mask. This mask reminds me a lot of the Korean sleeping masks, it’s just cleaner – organic, made with avocado oil, shea butter, and jojoba – instead of mineral oils and petroleum derivatives. Put this on at night and you’ll wake up to comfortable, hydrated skin. 4. Biologique Recherche Masque Vernix – The price tag is hefty, but this mask works. A thick layer cured a dermatitis rash outbreak overnight. That’s how powerful this stuff is. As a beauty blogger, I’m constantly using new products and I was testing out a Vitamin C serum that caused a small perioral dermatitis rash around the left side of my mouth. I was horrified. I applied this mask, went to bed, the next day it was gone. Now, when I used this mask on healthy, non-inflamed skin – it was okay, good even. But it really shines when healing problematic inflamed skin. I would only recommend investing in this product to keep as your 911 emergency rescue mask OR if you have persistent inflamed skin. 5. Sonage Tulsi Soothing Clay Mask – I have a “less is more” approach to drying out acne spots. I am not a fan of acne spot treatments since in my experience drying out the skin exacerbates the situation, instead I prefer to use soothing, antiseptic masks like this one from Sonage. It hits all the necessities to combat breakouts – detoxing clays to remove impurities, antibacterial and antiseptic ingredients (neem leaf + rose), and soothing adaptogens to reduce redness and inflammation. 6. Jurlique Antioxidant Gel Mask – I have pigment and acne scars, and am eternally looking for a gentle way to brighten and lighten both. Unfortunately, the best way to tackle both is usually with acids (Vitamin C acids, AHAs, BHAs etc) and most acid products are too strong for my skin can’t handle. Luckily, I stumbled across this antioxidant mask by Jurlique; one of their best selling masks. It utilizes both ascorbic acid (Vitamin C) and willow bark extract (natural form of salicylic acid) in low concentrations enough to brighten the skin without over-stressing and irritating sensitive skin!